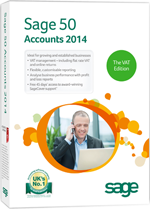 Sage 50 Accounts is the UK’s market-leading accounts software. It’s easy to get started and puts you in complete control of your finances, customers, suppliers and VAT, leaving you with more time to run your business. Understand and take control of your day-to-day finances with Sage 50 Accounts. Designed for established small to medium sized businesses, Sage 50 Accounts helps you manage your accounts with ease, makes light work of managing your VAT, and frees up more of your time to run your business. The Sage 50 accounting range comes in three versions – Sage 50 Accounts, Sage 50 Accounts Plus and Sage 50 Accounts Professional. Accounts software to help simplify and manage your day-to-day finances, customers, suppliers and VAT Ideal for: Established small to medium sized businesses who need to take more control of their finances.